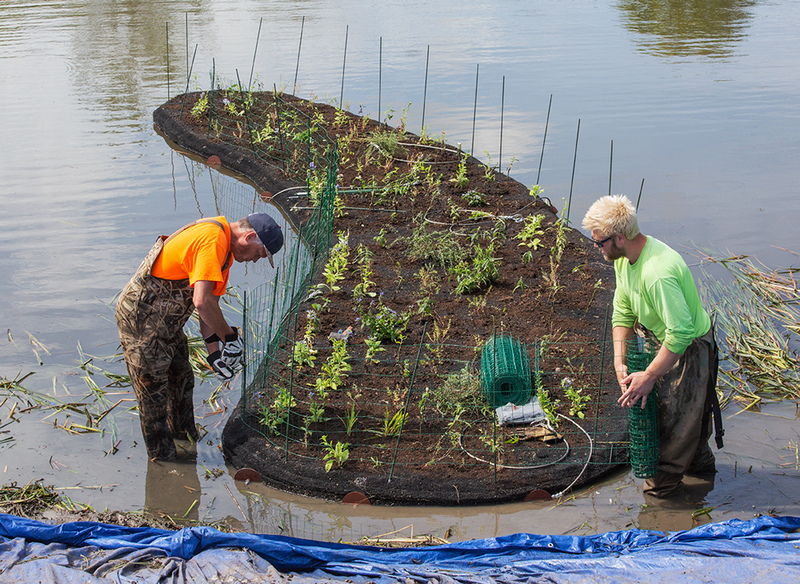 Looking like giant pot scrubbers bristling with young plants, six floating islands recently were installed in the Hartung Park stormwater pond. 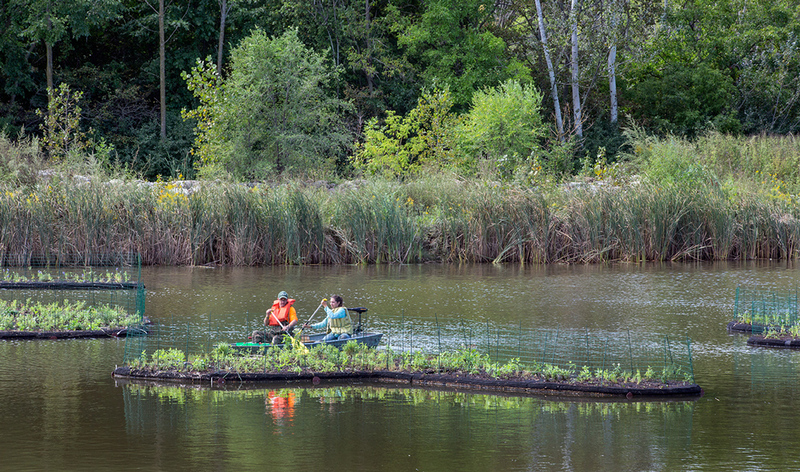 The islands, planted with native wetland vegetation, are an innovative way to both improve water quality and create diverse habitat. 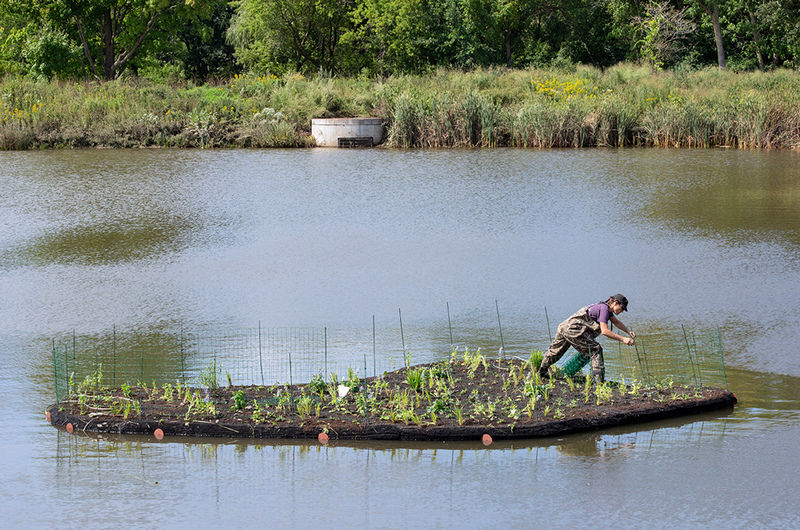 Together the six islands total 1800 square feet of surface area, creating a platform for what will eventually become a complex, healthy ecosystem both above and below the water line. The six islands, viewed from the labyrinth at Hartung Park. 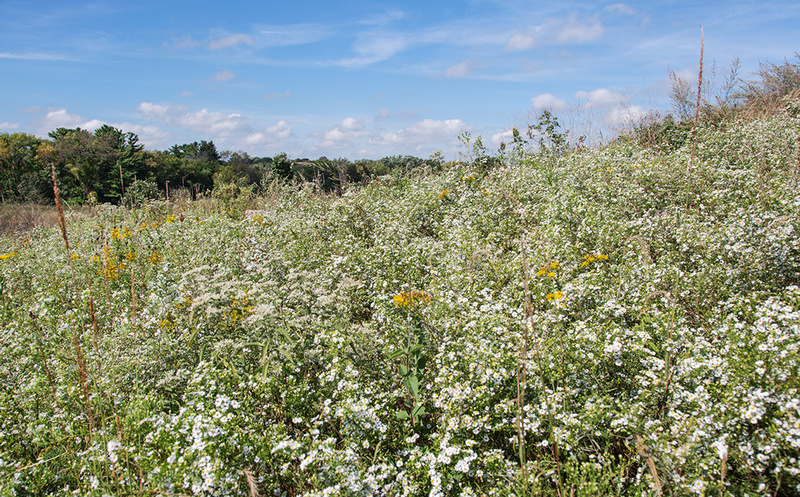 The islands were planted with 12 native plant types (see note 1), many of which were selected to attract birds and insects that act as pollinators. Once the plants are established, massive root systems will reach down into the water, providing favorable conditions for microbes that can digest pollutants. The vegetation will take up unwanted nutrients, such as fertilizer runoff, which helps to reduce excessive nitrogen, phosphorus and suspended solid substances that can cause algae growth and murky water. Workers prepare one of the islands for launching. One of the great advantages of floating islands, which are anchored to keep them in place, is that they provide protection for wildlife from predators such as raccoons, foxes and coyotes. 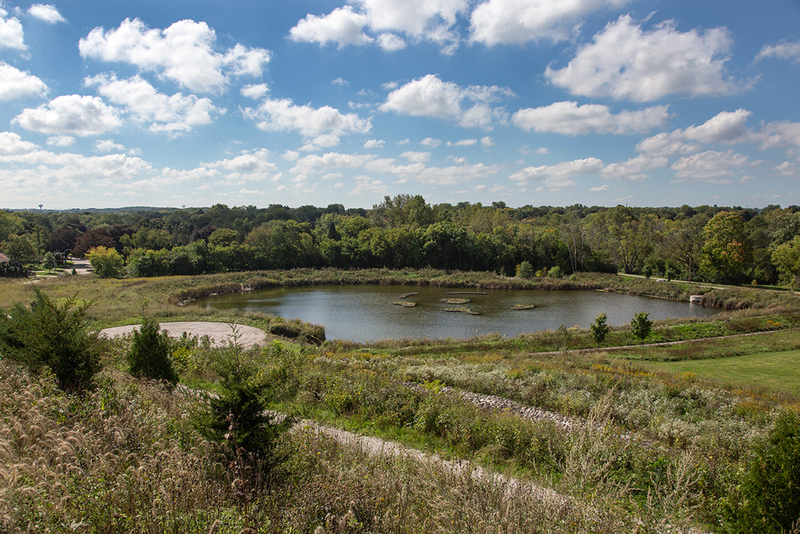 Visitors to Hartung Pond will be able to see turtles, frogs, butterflies, dragonflies, birds, and ducks. Currently there are no fish in the pond, but if they were to be introduced the islands would provide food and shelter from bird predation. Adding the fencing to keep geese off the island. If you go there now, you will see that each island is ringed with fencing. This is to deter geese from pulling up the new plantings. 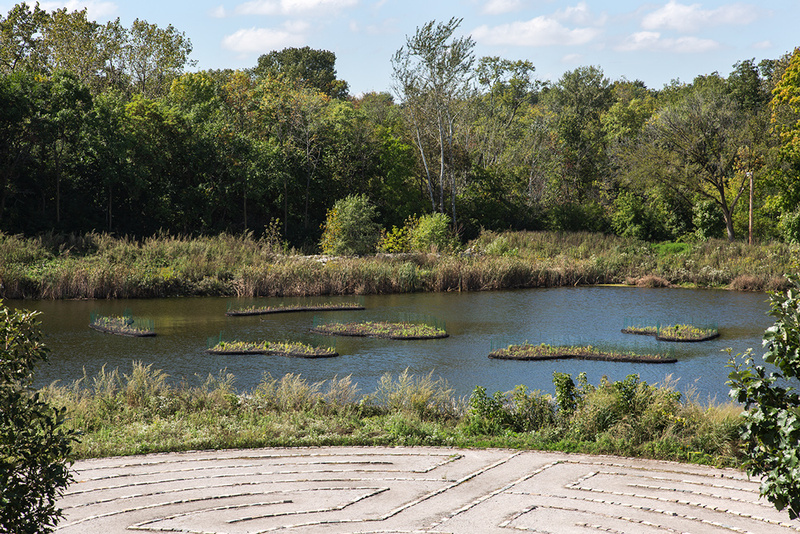 The anchored islands are designed to go up and down as water levels fluctuate, making them ideal for storm water ponds like this one. The islands have a beneficial side effect, too. Essentially buoyant mats, they are made from 100% recycled plastic (see note 2). The manufacture of these six islands keeps the equivalent of 45,000 plastic bottles out of landfills. The pond viewed from the hilltop. Hartung Park, which straddles the border between Milwaukee and Wauwatosa, is jointly owned and managed by the two cities. Relatively new, the park was created on top of the old Hartung Quarry. The park opened to the public in 2010. Workers attaching concrete anchors to an island. The islands were designed by Patricia Votava, Project Engineer for the City of Milwaukee, who came up with several variations before the final ones were selected. “We wanted to reflect the nearby labyrinth in our design,” she told me in an email. However, to make them “appear more natural” it was decided not to make the islands as geometric in shape as the actual labyrinth. The final design uses lozenge shapes in various sizes. 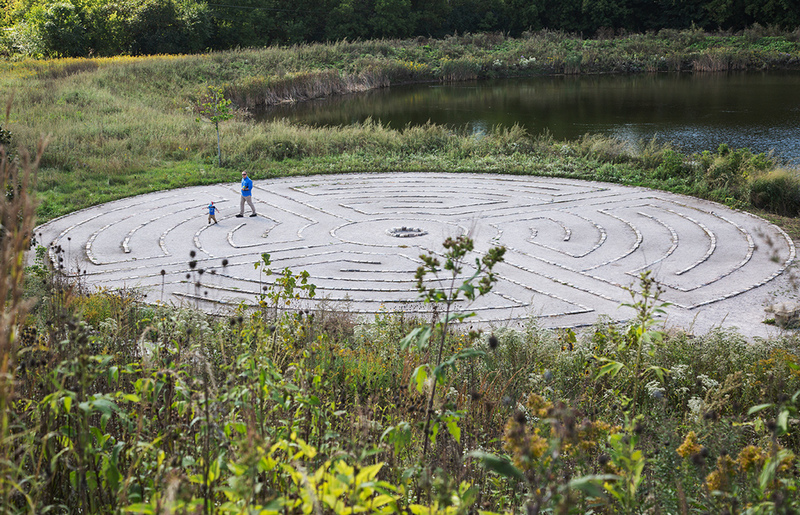 Don’t forget to walk the labyrinth while you’re there! 1. Plant types include Great Blue Lobelia, Boneset, Cardinal Flower, Crooked Stem Aster, Bluejoint Grass, Bottlebrush Sedge, White Turtlehead, Joe Pye Weed, Marsh Marigold, Prairie Blazingstar, Riddell’s Goldenrod, and Winged Loosestrife. 2. The plastic used is BPA-free Polyethylene terephthalate or PET, a polymer resin commonly used for food and beverage containers, among other things. BPA—bisphenol A—is an industrial chemical used in some plastics that may cause adverse health effects. This story was edited by Eddee Daniel from input provided by Autumn Boos, Director of Sales and Marketing for Midwest Floating Island, Kurt Sprangers, Storm Water Manager for the City of Milwaukee, Patricia Votava, Project Engineer for the City of Milwaukee, and Rebecca Olson of Olson Ecological Solutions. Photos by Eddee Daniel.